The Ogden Mills residence designed by Richard Morris Hunt between 1885-1887 at 5th Avenue and East 69th Street in New York City. Mills was a financier, philanthropist, and son of Darius Ogden Mills. He was married to Ruth T. Livingston and the two were the parents of Ogden L. Mills of Woodbury, Gladys Mills Phipps of 'Spring Hill' in Old Westbury and Beatrice Mills Forbes. The house was demolished in the late 1930s and replaced with an apartment building. Click HERE for more on the Mills estate at Staatsburgh, remodeled by McKim, Mead & White c. 1895. 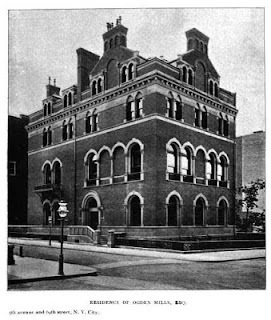 Photo from Architectural Record, 1895. As long as we're playing one degree of separation, let's also not forget Ogden Mills' sister, Mrs. Whitelaw Reid, whose New York house was the main wing of the Villard houses, and whose country house, 'Ophir Hall' is this weeks feature in Big Old Houses (http://newyorksocialdiary.com/node/1908721). Quite a well-housed family, all-in-all.